I made my way from one of the more distant gates in Terminal 1 at Heathrow – it seems that United is always at one of these gates. I quickly walk through Customs/Border Patrol following the signs for UK/Ireland Connections. I was behind three Japanese Business men who were on my flight from Chicago and were heading to Dublin as well, but were struggling very much communicating with the Border Patrol folks. I manage to make my way around these guys and head off to the Aer Lingus Transfer desk, needing to get a new boarding pass before the folks at the Star Alliance Lounge folks would let me in and take a shower. The Aer Lingus ticket agent confirms that I have no checked luggage and suggests I take the 06h50 flight in lieu of the 08h50 flight. I decline and tell her I wanted to shower and shop a bit, she doesn’t agree and prints me a boarding pass for the 06h50 flight and tells me to run for the flight as it is already boarding. I tell her again, I don’t want to go early, my ride isn’t arriving until 10h20, so I’ll just be stuck at the airport with nothing to do. No dice. She tells me they are expecting delays and cancellations later in the morning and if I want to get out, I better go now. Ok, deal. I head out to find the Aer Lingus gate — which ironically enough is almost as far as the United planes, but just the opposite direction. After about 20 minutes I make it to the gate and see that no one has boarded yet and there are rumblings of a cancellation. Luckily those were unfounded rumblings. I was not looking forward to schlepping all the way back to the transfer desk. We begin to board and the Gate Agent says my bag is too big to fit on the plane so I have to gate check — I wasn’t going to argue, but we were flying a traditionally configured A320, my 20″ roller will fit, c’mon. Since I will have two hours to kill at Dublin International Airport, I might as well check. This is my first time on Aer Lingus and I must say, I am so happy I am not flying this airline long haul. The pitch on the short hall flights is a whopping 30 inches — and I thought flying TAP was bad. The flight was short and the weather was bad – we were bouncing around so much the stews didn’t even get up once. They did apologize profusely for not being able to offer service. The flight itself was very full, with only one seat available — the middle seat next to me. Everyone, but me, on the flight was wearing a business suit and tie. The guy across the aisle from me takes this flight every day to his job in Dublin — now that seems just crazy to me, can you imagine doing that every day? Kill me. We landed about 30 minutes early and were greeted by cool (5C), rainy and grey weather. First impressions of Ireland reminded me of my youth in Oregon. I make my way though Border Protection and was surprised (not sure why) that the Irish passport stamp is green and made my way to baggage claim. Once I collected my bag I went off to purchase a SIM card and wait a couple hours until MS picked me up. While waiting, I did check the arrivals board and found that not only my original flight to Dublin from Heathrow but the one following that were cancelled. 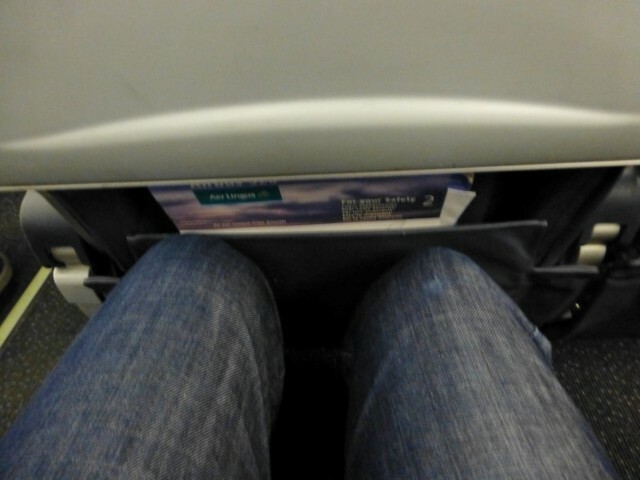 Thank you Aer Lingus Transfer Desk Lady for pushing me to the earlier flight. All in all, Aer Lingus was a very acceptable way to get to Dublin – on a super short haul flight. I wouldn’t fly them on a long haul route though. Have you flown Aer Lingus? What is your favorite way to get to Dublin? By Tim in Travel on December 4, 2012 .